Books Are Sanity!!! : A Place for Miss Snow by Jennifer Moore, Blog Tour & Giveaway! A Place for Miss Snow by Jennifer Moore, Blog Tour & Giveaway! Miss Diana Snow is everything a British chaperone should be—she finds satisfaction in order and depends wholly upon the rules of decorum as she negotiates the isle of Greece with her young charge. But Miss Snow's prim and proper exterior masks a disquieting past: orphaned and alone in the world, she has only her stiff upper lip to rely on. When a brief encounter with a handsome stranger challenges her rules of propriety, Diana is unwittingly drawn into an adventure that will turn her ordered world upside down. Alexandros Metaxas is a Greek spy working to recruit individuals to the cause of revolution. His mission seems to be going perfectly until he encounters Diana Snow, a captivating—if slightly cold—beauty. When their paths cross again, the ill-fated reunion threatens all Alex has been fighting for. But more importantly, it places Diana's life in jeopardy. There is only one way to save her: they must put themselves at the mercy of the most powerful pirate family in the Mediterranean. Soon, Diana is plunged into a fantastic world of gypsy curses, blood feuds, and unexpected romance. But when a bitter vendetta places her in mortal danger, will she have the courage to fight for life and love? This is not your typical regency romance novel! Miss Snow is a companion and chaperone to her young charge and is taken captive by pirates and criminals! She finds herself thrown into a foreign country where she doesn't know the language or the customs. The only person she knows is Alexandros and he is the reason she is there to begin with! 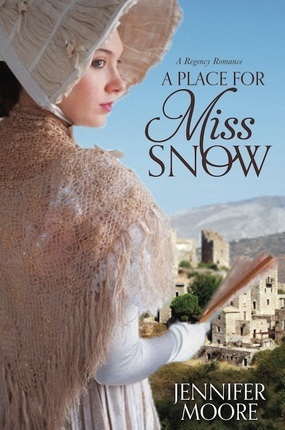 A Place for Miss Snow is a whirlwind adventure from two points of view; Miss Snow's and Alexandros'. Can and will these two completely opposite individuals find any common ground or even think about love? Moore envelops the reader in the culture and beauty of Greece! As you immerse yourself in all things Greece, you will come to love the Mavromichaleis family and their sense of honor, love and faith! You will feel it too as you begin your own journey in A Place for Miss Snow!